We start out by focusing on your image first, through branding and through our process we will help you turn your plans into reality. We take into account your goals, objectives and existing marketing, and use that information to create the appropriate look and feel for your site. It is important to strategically position yourself and be seen on Google and other search engines. We also appreciate the business impact of you having a mobile friendly website. First impressions and perceptions are critical. In this day and age, many buyers seek information from the Internet first in order to screen companies that they want to do business with. When we design websites, we focus on making sure the content is placed in the correct location on the website that supports your business and drives sales. 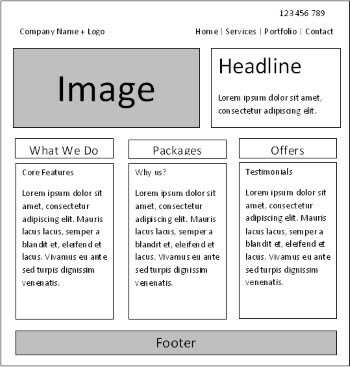 The purpose of the wireframe is to create a visual guide or blueprint that represents the arrangement of elements to best accomplish your particular purpose. As a minimum, a website layout will usually have a company logo, page navigation, content and a footer. Upon request, we can include a header section where a showcase slider with image/s can be displayed. Opalwebdesign will work through these items with you during the design of your website. Your website, while under development, will be available online for you to follow the progress. You are in complete control of the website.You can add pages, make unlimited changes, and even upload your own photos and embed Youtube video clips. You don’t need any advanced technical knowledge, and you don’t need to purchase expensive software. Yes this is correct.